Spectroscopy is second to photography with regards to importance. It was the photography of spectra that birthed Astrophysics. The term spectra is defined as the entire electro-magnetic wavelength. Spectroscopy began in 1666 when Sir Isaac Newton discovered that white light passing through a glass prism split the light into a rainbow. To confirm this, Newton passed the rainbow through another prism and it recombined into white light. In 1857, Gustav Kirchhoff and Robert Bunsen experimented with laboratory chemical spectra and determined that each chemical element has its own unique spectral signature - called spectral lines. Furthermore, Kirchhoff summarized the three important elements of spectra, called Kirchhoff's Laws. To understand the laws, it is important to understand the concept of a "blackbody." This is not an object that is black or dark, instead a blackbody is a theoretical object that emits all light and radiation that is directed to it. If 100% of light were to illuminate a blackbody, 100% of that light will be emanated. 1. A blackbody process a continuous spectrum, free of any spectral lines. 2. A hot, transparent gas will produce emission lines - a series of bright lines against a dark background. 3. A cool transparent gas in front of a blackbody will produce absorption lines - dark lines on a spectra that would appear in the same place as a hot gas cloud comprised of the same elements. The slit - only a small section of light is required for a spectral analysis. This also helps remove any stray light. The collimator and diffraction grating - the collimator focuses the light onto the diffraction grating where light is split into its fundamental colors. 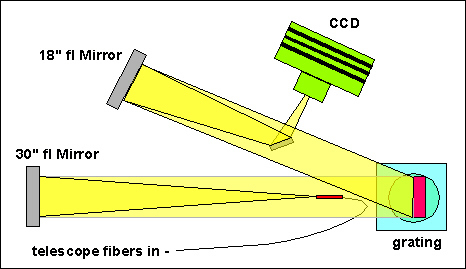 Camera lens or CCD detector - the reflected spectra is then captured on film or CCD for analysis. 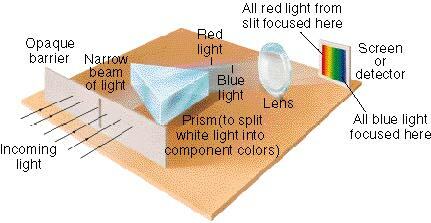 A diffraction grating is nothing more than a special cut glass plate with small lines etched into the glass. The more accurate and more numerous the cuts, the more accurate the spectra. The reason gratings are used instead of prisms is that the grating can be adjusted and the prism cannot. The prism of a spectroscope must have 60 degree angles and cannot be rotated. The image above is from the Spectrashift.com group of amateur astronomers using this style of spectroscope to capture the radial velocity of a stars wobble as a result of an exoplanet. The image below shows the Fraunhofer spectra, complete with the brightest Fraunhofer lines (shown by letters of the alphabet). This image also shows the frequencies of each color. Image Credit - and additional information.